Over the past three years, we here at College Sports Journal have projected the Division I FCS football projections using the Sagarin rankings. We are starting to do this for selecting this year’s NCAA Men’s Basketball tournament using these same Sagarin rankings for the field of 68 teams. We use the Sagarin rankings to select our Top 25 teams currently for our Mid-Major poll and High Major poll. We will be giving a projection for the Field of 68 schools each week following the release of each Top 25 polls until the actual selection of field on March 17th. As actual champions are crowned, these will also be placed into the projections. The following are the 32 projected Division I conference champions. The ones highlighted in YELLOW are what we categorize as Mid-Major conferences. The ones highlighted in GREEN are ones we categorize as High-Major conferences. And the ones highlighted in BLUE are ones we categorize as Major conferences. The following are the 68 teams based on the Sagarin rankings and using the 32 automatic qualifiers and the 36 at-large qualifers. 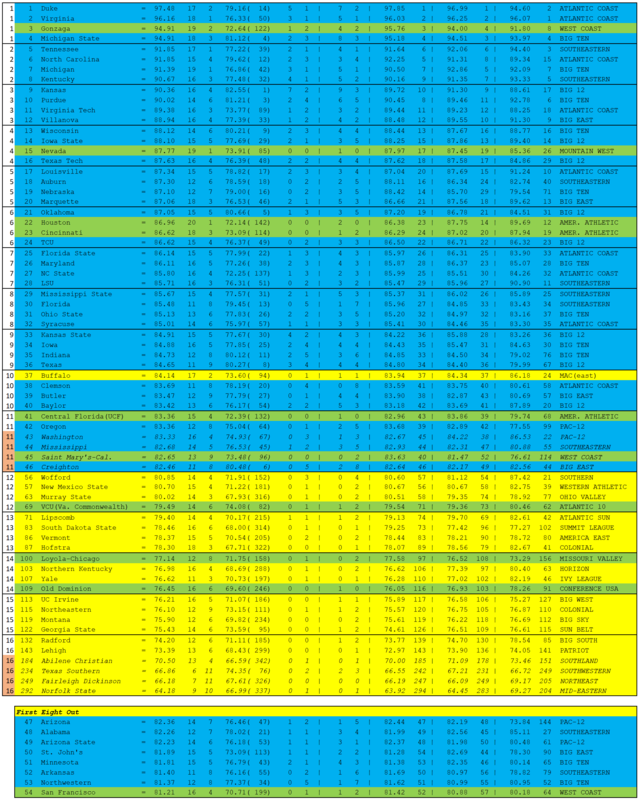 Note just as above, the teams highlighted in YELLOW are ones from Mid-Major conferences, in GREEN are High Major conferences, and in BLUE are from Major conferences. Each of the seeds are highlighted for the four regions with the exception of the #11 and #16 seeds, which have six teams as those are the seeds in these projections that would play in the First Four games. The eight First Four teams are highlighted on the left in ORANGE and in italics. These teams are the last four at-large teams and the last four automatic qualifying teams. All the Mid-Major conferences are projecting just the conference champions as qualifiers and no at-large selections. The High Major conferences, however, have two additional teams from the American Athletic Conference (Cincinnati & UCF) to join champion Houston. And the West Coast Conference added one additional team (St. Mary’s) to join champion Gonzaga. The WCC also has one of the first eight out currently in San Francisco.